Sunnen Products introduces its new SHO-965 honing oil, a super-compliant, low-VOC formulation based on its most widely used general-purpose oil, MB-30. The new oil exceeds the strictest standards of the South Coast Air Quality Management District, the California agency responsible for Orange County and the urban portions of Los Angeles, Riverside and San Bernardino counties -- the smoggiest region of the U.S., which also has the highest concentration of metalworking operations in the country. The new SHO-965 oil has a more pleasant odor, yet retains all of the high-performance qualities of industry-standard MB-30 oil, including maximum cutting rates and increased abrasive life when honing difficult materials like stainless steel. SHO-965 is also highly versatile, working on virtually any metal from aluminum to zirconium, and effective as a general cutting oil for screw machines, drilling, tapping and reaming. Its long service life also helps decrease cost per part. "Our testing and the feedback we've received from the field indicate SHO-965 oil performs as well as MB-30 with much lower VOC content," said Chuck Korn, product engineer at Sunnen. "To meet the strictest environmental standards, we lowered the vapor pressure of the new oil by replacing the base oil with highly engineered petroleum and organic oils. 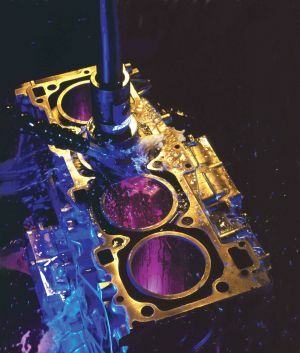 Reduced VOC fluids are a trend globally, so we are meeting the contemporary needs of the metalworking industry by reducing the environmental impact of our fluids without sacrificing performance." SHO-965 joins Sunnen's planet friendly oils, SHO-500, MAN-863 and KG3X, which are listed as BioPreferred™ products by the U.S. Department of Agriculture. The new oil is available in 5-gallon (18.9 l) pails, 55-gallon (208.2 l) drums and 330-gallon (1,249 l) totes.